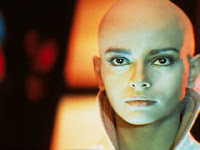 Going Bald for St. Baldrick's - Or, Star Trek Made Me Do It! I am a Classic Trekkie. That is, I prefer the original Star Trek over all the incarnations that followed it. In fact, when I was a preteen, I kept a binder with listings of all the episodes, books, and photonovellas that were out. Yes, I am a geek. This was back in the late 70's. I was still living overseas and was excited yet disappointed when the first Star Trek movie, Star Trek: The Motion Picture came out on December 7th, 1979. I remember the day exactly because of my birthday, but I was half a world away and would have to wait to finally get to see it. In that movie the Indian actress/model Persis Khambatta played the bald headed alien, Ilia. She was gorgeous even without hair. Even though the movie stunk for overall quality, it was still a hit and Khambatta's role was unforgettable. It was then that I first had a curiosity over what I might look like bald. Enter the 80s and now we had people like Sinead O'Connor and Grace Jones. Later on you can add Natalie Portman, Demi Moore, and most recently, Britney Spears. Certainly if they could do it, I could too. I've actually always been able to carry off any haircut I get. I have an oval face shape and a long neck and so I've had bristly short hair to hair just to my shoulders. What I can't seem to pull off is curls and length. My hair is super fine and healthy. It refuses to hold a curl without being cemented in place. It also looks straggly once it starts getting to shoulder length. I've seen people participate in St. Baldrick's in past years. St. Baldrick's is a charity that raises funds for children's cancer research. Their biggest fundraiser is to have people shave their heads. These events take place all over the world and are quite popular at pubs. I personally have never known a child to be battling cancer, but I know that there are thousands out there. It's dramatic enough to battle cancer, but then there is the added burden of going bald. Here in Sacramento, de Vere's Irish Pub hosts one of the events. This year they are challenging their new sister pub in Davis as a Battle of the Pubs. By the looks of the bars' pages though, Sacramento is going to win just from the amount of people who have signed up so far - 19 vs. 4. This year I decided to take the plunge myself and joined the Sacramento team. Sometimes I get one of those bugs in me that just itches. I was asking people if I should do it, worried that I wouldn't be able to raise my goal of $1000. I soon realized that I needed to put my head into it instead of just talking about it. If I didn't do it it would seem like I had woosed out. So I've gone ahead and signed up and this is my fundraising page. The event takes place on March 12, which works out well for me. As you know, I'm holding the first Sacramento Food Film Festival on March 10. I will need to do a bunch of publicity before it. I'm already scheduled for Channel 10's Sacramento & Co. on February 27th. I'd prefer to have hair for that. March 12 works perfectly. I'll be done with the festival and it will be the tail end of winter. So please, pay to see me bald. It will, of course, be a future blog post around March 13th with all the before and after pictures. It's a wonderful cause. Again, this is my fundraising page. And thank you!